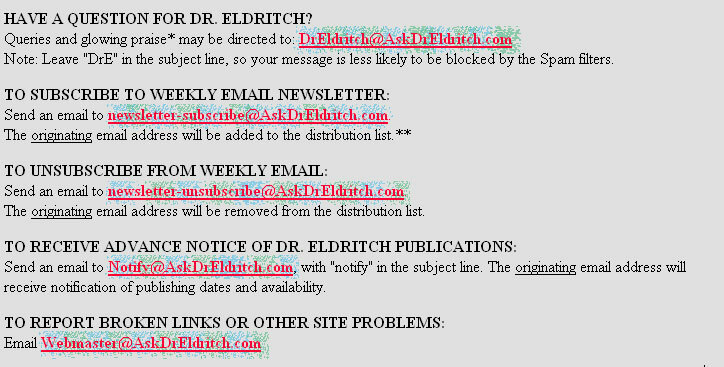 www.AskDrEldritch.com -- Contact Dr. Eldritch! * All letters become the sole property of Dr. Eldritch, and may be altered, edited, published or reprinted. Names and details may be changed to protect the living, dead, or undead. ** A confirmation email will be sent to the email address. A reply must be made from the confirming email address to initiate the subscription. No further correspondence will be sent to unconfirmed email addresses. Sorry, the hyperlinks have been deactivated as a spam-prevention measure.